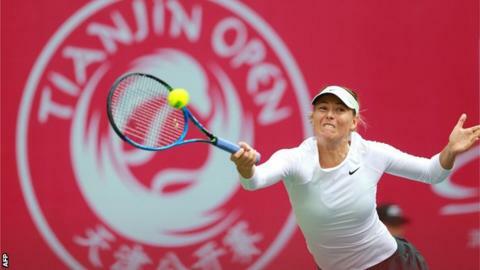 Former world number one Maria Sharapova won her first title since May 2015, beating Aryna Sabalenka 7-5 7-6 (10-8) in the Tianjin Open final. The 30-year-old Russian was playing her seventh event since she returned to the tour in April from a 15-month drug ban. She trailed 4-1 in both sets before overcoming the 19-year-old Belarusian, who was contesting her first WTA final, in two hours and five minutes. It is the five-time Grand Slam winner's 36th WTA tournament victory. Sharapova was denied a wildcard for the French Open, missed Wimbledon through injury and reached the US Open fourth round as a wildcard before losing to Latvia's Anastasija Sevastova. The Russian, who began the week ranked 86th in the world, received a wildcard for the event in China. She broke a nervous-looking Sabalenka in the opening game but then lost four games in succession as the teenager struck back with aggressive returns. The Russian got back on serve at 4-3 after a 16-point game and then claimed the decisive break with a forehand winner down the line. World number 101 Sabalenka surged into a 5-1 advantage in the second set with some more fiercely struck returns before Sharapova responded with five consecutive games to serve for the match at 6-5. But she was unable to complete victory and a double fault sent the set into a tie-break, which saw the players drop four successive points on serve. Sabalenka survived three match points but a double fault gave Sharapova a fourth chance and she duly recorded her first title since the Italian Open two years and five months ago. The result means Sharapova moves up to number 57 in the world rankings.